There are two basic Bingo face cards 75 Number and 90 Number. Conventional 75 number bingo is a well known game. Players are provided with bingo cards that have a grid of five horizontal rows and five vertical columns. The columns are lettered B I N G O from left to right across the top of the grid and each bingo card has five numbers in each row except the center N column which has a “free space” at the intersection of the third row and the third column. Bingo balls individually numbered 1-75 are mixed together and the balls are randomly selected one at a time. 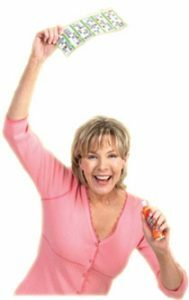 As each ball is selected, the number is announced to the players, who dab or mark the corresponding number on their bingo card with a bingo ink marker/dabber. When a player completes a predetermined arrangement of covered numbers on the bingo card, that player yells out “Bingo!” Once the bingo card is verified as being correct, he/she wins the game. In the conventional manner of play of bingo, in order to win the game, a player must cover five spaces in a vertical column, a horizontal row or along one of the two diagonals of the bingo card. 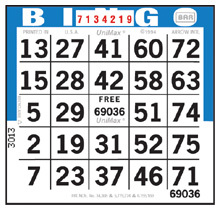 The free space in the center of the bingo card allows a player to win with as few as four numbers being drawn. Winning combinations for example, can also include the covering of numbers on the bingo card so that letter symbols are formed such as an X, T or L.
The manager of the bingo game must identify which particular combination or combinations of covered numbers will be the winning patterns for that particular game. It is also popular to play “coverall” or “blackout” games in which all 24 of the numbers on the bingo card must be covered in order for the player to win. Players purchase bingo cards for use during the bingo session, which creates a pool of money. Winning players receive a pre-announced cash or merchandise prize. Typically, a bingo session includes a number of individual bingo games concluding with a coverall game in which a large prize is awarded. The other variation of bingo is known as 90 number Bingo and is generally played in Europe and South America as well as in other areas of the world. There are ninety numbered bingo balls without letter designations. Each player must purchase a bingo card with three horizontal rows, each row having five numbers therein with the rest of the row comprising blank (free) spaces. The caller draws numbers randomly from the group of ninety numbered balls and a player wins when they cover all five numbers called on a single horizontal row of the bingo card. Other game options would require that 2 or all 3 horizontal lines to be covered to be a winner. These winner requirements and the prizes to be paid are announced or published by the game manager prior to starting the bingo game.